Mountain Laurel Retreat is a private, family owned paradise. The property sits on 250 gorgeous mountain acres with sweeping mountain views. Our "Red House" is a two bedroom and one bath board-and-batten cottage. Double bed in first bedroom and two twin beds in second bedroom. There is a queen sized sofa bed in the living room in front of a big stone fireplace. Fully equipped kitchen. Modern bath with tub and shower. Automatic heating system. Snug, cozy and cabinish. Favored by honeymooners, even in November. Observation Deck: There is a fantastic view of the Back Mountains and Mt. Mitchell from our observation deck. The deck is an easy walk from the Red House and is an absolutely terrific place to watch sunsets as beautiful as you will see any place. As night falls and the stars come out, you can lie on the deck and see a show of shooting stars to remember forever. The Red House has an eat-in kitchen. Bring your own towels, bed linen and paper products. The water source is spring water - you may want to take jugs of it home! Picnic table in yard. The Red House is located on the perimeter of our privately owned 250 acre mountain top that is one mile long, half as wide and 800' top to bottom. It is bordered by the Pisgah National Forest and the Blue Ridge Parkway. The cottage is not on the mountain rim but the easily accessed observation deck with outdoor fireplace/grill and picnic tables is on the very top of our knob. At 3800', you are up there in the cool alongside the famed Blue Ridge Parkway. You will see Tennessee 30 miles away and Mt. Mitchell (highest mountain in the east) in full view right across the valley. Off to the right, the valley is dotted with big and little ridges and knobs as far as the eye can see. Often you see only their tops protruding through the mountain valley mist. Jim and Susan Wilburn purchased Mountain Laurel Retreat from Susan's Father, George Wentzell. George and his wife Madge and Jim and Susan love the land fiercely and hope to pass this love onto many future generations to come. Ski Beech, Sugar and Ski App are all within one hours drive. We used to provide internet but the only available service was so slow we decided to discontinue. Cell phone service can be sketchy but there is a landline in the cabin. Neat cabin owned by the nicest people I have met! We stayed in the "Red House" several days and we loved it. The solitude was perfect as there was no TV, computer or phone service. There was phone service at the observation deck allowing you to make the choice if you wanted to call to check in. Once there you will opt for the view and put the phone away. We absolutely loved our weekend in the Red House! So cozy and quiet, we loved being surrounded by nature! Our dogs loved running around near the observation deck, and we loved meeting the owners. We will remember their hospitality forever, and can’t wait to come back!!! My husband and I enjoyed our stay here. The cottage was very cute. The property is AMAZING! It was rainy and foggy so we did not get to take full advantage of the overlook but we could tell it was beautiful. The cottage is in a good location right off the Blue Ridge parkway near some great hikes. Mt Mitchell is a must see as well as Crabtree falls. Overall the place was pretty clean but the bathroom could have been a bit cleaner as well as the inside of the cupboards. But we still really enjoyed our stay and would go back. We had two couples who were part of the trip to the Mountain Laurel Retreat for the weekend. We were full of anticipation and excitement while driving down the narrow gravel road just to reach the cabin. Pure amazement was felt as we first saw the red cabin. A sense of warmth, and tranquility quickly came to mind. The cabin is surrounded by woods, and had everything we needed, from clean water, heat, to A/C, and even wifi. We didn't stay inside too often because the weather was absolutely perfect! Two miles from the Blue Ridge Pkwy was convenient, and the overlooks were worth stopping to take the famous "autumn in the mountains photos." But we mainly stayed by the cabin, and walked around the knob. The observatory deck was a must view to check out the stars. We were lucky enough to visit during meteor showers. We did have some water issues, but Julie and Susan were quick to remedy the situation. We really appreciate the hospitality and hope to return again next Fall. 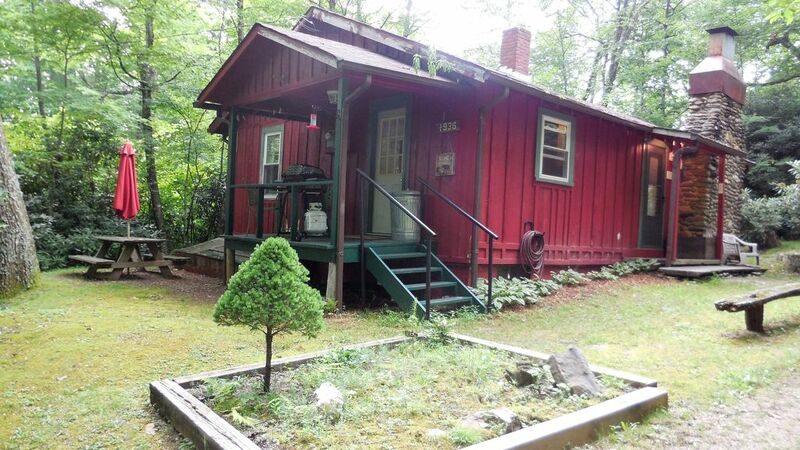 Absolutely beautiful secluded mountain laurel retreat with wonderful friendly owners! We enjoyed a wonderful 5 days on this 250 acre property. We stayed in the little red house which I believe was built in the 50's. The moment you open the door, you experience the warmth and love and care this cabin has received throughout the years. The cabin was perfect, from the stone fireplace, wood and stone floors, to the selection of the bedding and decorations in both bedrooms. The bathroom was very clean as was the good size kitchen and cozy living room. There was plenty of light throughout the cabin. The heater heats very quickly. There's a porch off the kitchen with grill, table and chairs. There are also cut logs for the fireplace. We brought our two boxers and they thoroughly enjoyed walking the property, playing on the knob, and hiking with us the 4 mile round trip from property to Blue Ridge Parkway. We also went to Crabtree Falls, and took a day trip to Blowing Rock. Mostly we wanted to enjoy staying on the beautiful property! The Wilburns are wonderful people we would like now to call friends. They welcomed us upon arriving and wanted to be certain we had everything we needed. Other than that, they gave us our privacy unless we approached them. The Red House is secluded and private. There is also a Blue House rental which is also private. The Wilburns are "down to earth" real friendly people. You feel more like family than a guest. Susan Wilburn actually painted a number of paintings which decorated the cabin rooms. We feel very fortunate to have been able to stay on their property and bring our fur babies. We wish we had reserved longer than 5 days. We certainly will be back! Some guests have come for 20 years! We can certainly see why! Susan and Jim, thank you so much for sharing your 250 acres of "Heaven on Earth".